One of my red roses from a different angle. Hope your week’s going well so far…. 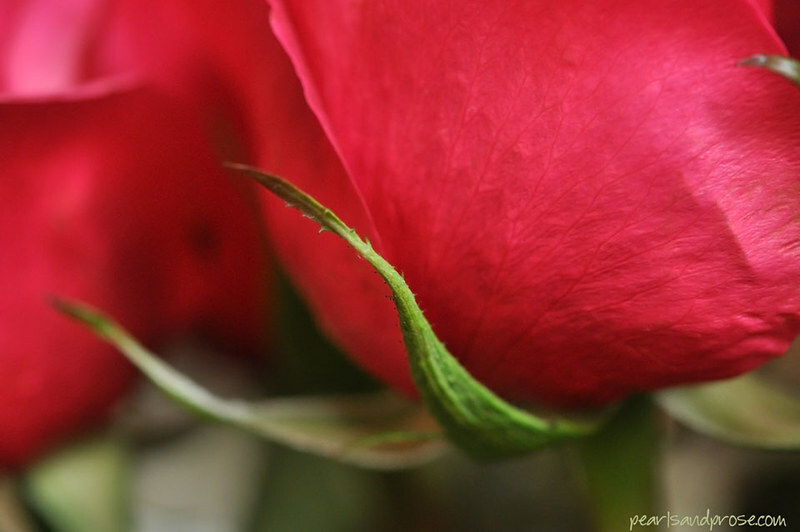 This entry was posted in photography and tagged macro, red rose. Bookmark the permalink. Sorry to hear about your back and congrats. I like the idea to see a part of a flower which is less in focus usually. With that bit of green it’s lovely. Thanks so much, Caroline. I’m not accustomed to back pain so this is really annoying. I bought an icy-hot patch and it’s helping quite a bit. Nice details. I like seeing the veins on the petals. Great news about the sales and the mention. Well done! Hope your back is leaving you alone without pain. I myself know quite well what that means, just recently was hospitalized because of too much pain. Anyways, I love your different perspective of a rose, it’s really exciting to discover what a flower looks like from a different angle. I’m really sorry to hear that and hope you’re OK now. I mostly have a lot of aches and stiffness, but it’s better tonight.